Chugz & Twizlberry: Buy 32oz. Fountain Drink, Get a FREE Party Cookie OR BOGO 50% OFF Frozen Yogurt! 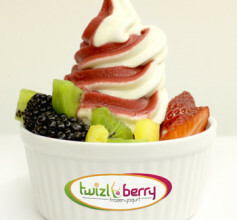 Don’t miss out on this Chugz & Twizlberry double Dealio today! You’ll be glad you took advantage of it. Buy a 32 oz. Fountain Drink, Get a Strawberry-Frosted Party Cookie for FREE from Chugz OR Buy One Get One 50% OFF Any Single Cup Frozen Yogurt from Twizlberry! *Must mention or show The Dealio to redeem. *Offers valid 3/23.